One of my friend called in after a long time. He invited me over to his brother's wedding at Nagercoil. Earlier I would have given a second thought of attending the wedding if it was not a weekend, this was on a Thursday. I felt I could visit some places nearby if I go and that's how this trip started. I had to go to Meenatchipuram bus stand to reach his home in Nagercoil and all I had was a 200 rupees note while the ticket cost was 10 rupees. I felt good when the conductor gave me the remaining change without scouling as I'm usually used to see in buses especially in the mornings. After reaching my friend's home, I went to the marriage after refreshments. I had to book Tatkal ticket at 11 am, so had to decide on a destination before that. Finally rounded up on Rameswaram and booked the ticket. After the wedding ceremony was over, I stayed for some time in his house and went to the nearby beach in the evening. It was a lovely beach-side village. This was an unusual beach experience. There was a Church surrounded by some houses, a prayer sound coming from the Church accompanied by the sound of sea waves for the background was surreal. 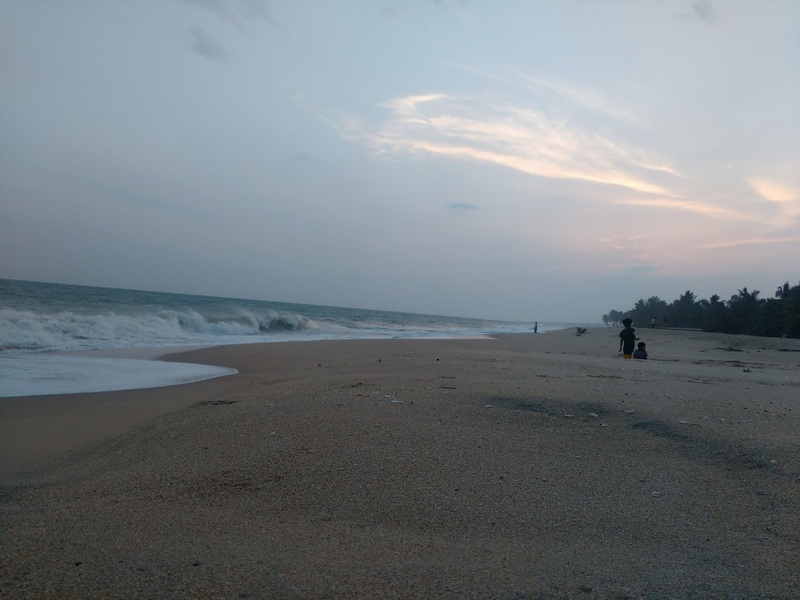 If you happen to have a friend whose house is near a beach, don't miss visiting him/her. Next day morning, I went to welcome the sun rise at Kanyakumari. Unfortunately it was cloudy and I couldn't catch the glimpse of the sun rising from the horizon. It looked like it came out from the clouds a little above. 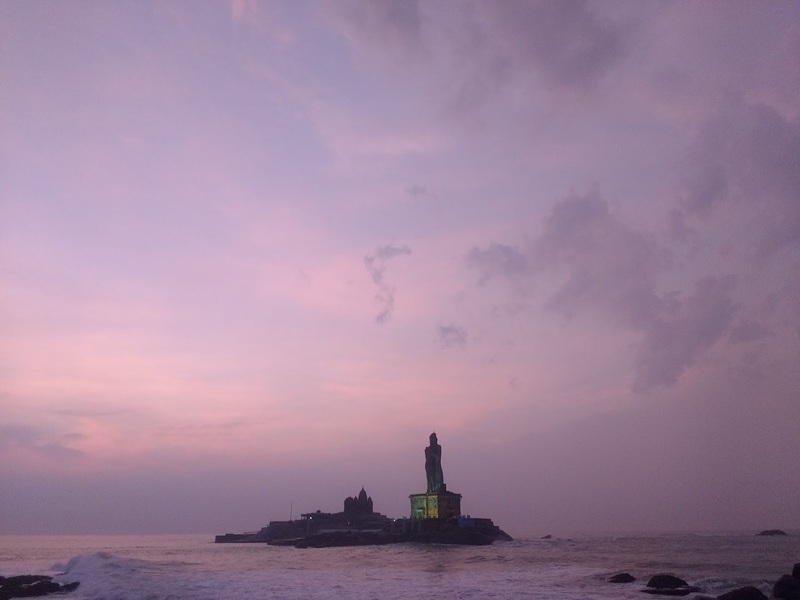 Then a localite gave me a tip saying that if I wish to go to Vivekananda rock memorial, I should go there after 11 am, else it would be way too crowded. So I had breakfast and went to see Gandhi mandapam and Kamarajar memorial. 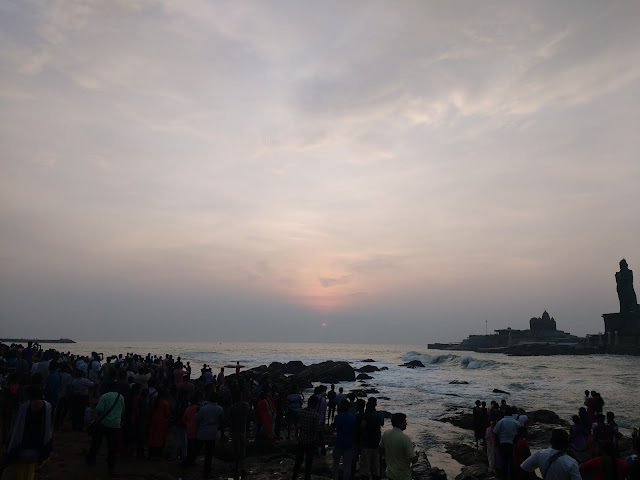 I felt that the whole of Kanyakumari is very commercialised and very crowded. Initially I wanted to only witness the sunrise and sunset. But the crowd made me lose interest and I decided to ditch the sunset for plan B which was thirparappu falls or plan C Padmanabhapuram palace. At 8.45 am I went and stood in the long queue which felt like forever when I finally reached Vivekananda fort at 11 am. I spent an hour there clicking some pictures and left there after. It was then I understood why the other person suggested me to go after 11 am, but I didn't have any other option. 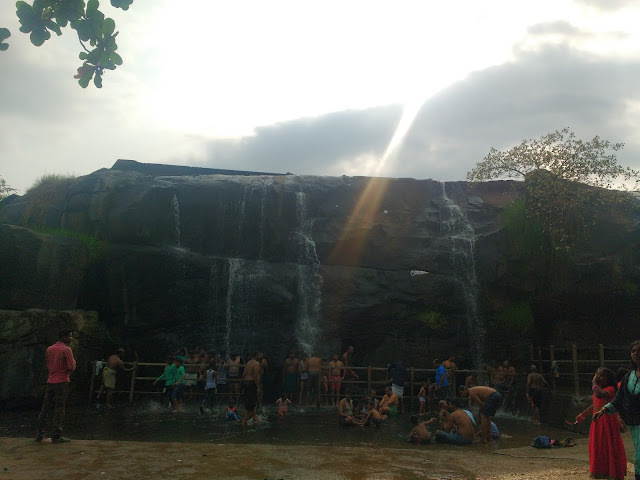 Then I chucked plan C and started towards Thirparappu falls via bus at 1 pm from a nearby bus stand. This place was 55 km away from Kanyakumari. I thought it would take around 1 and half hours but the road was bad and the bus, like an office cab, took a halt at every other person's house to drop them! Finally I reached at 3.30 pm. There was a great difference in the weather and landscape at this place. Note that I started this trip right after the onset of kathiri veyil (extremely hot summer in TN). Later I learned that Kerala starts a little distance from there. This falls wasn't so great but it was ok kind. I showered in the falls for about 45 mins and then went above that place. That place was amazing. 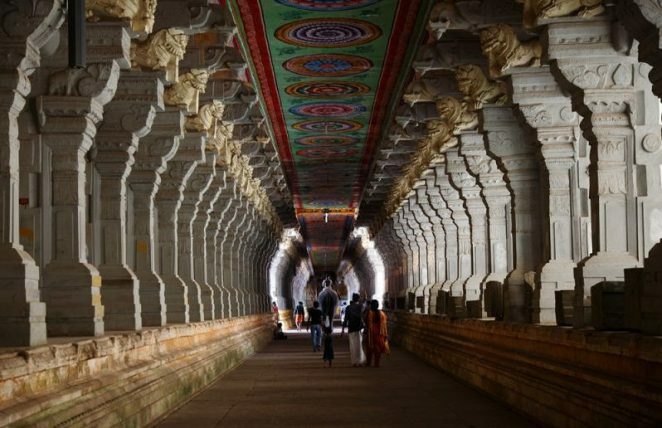 A mandapam that one we have seen in the movie Aanpavam is located here. I went a little further and there was an overbridge and a check dam. I again bathed there for some time and was off to Kanyakumari. Later that night, I boarded my train to Rameswaram. 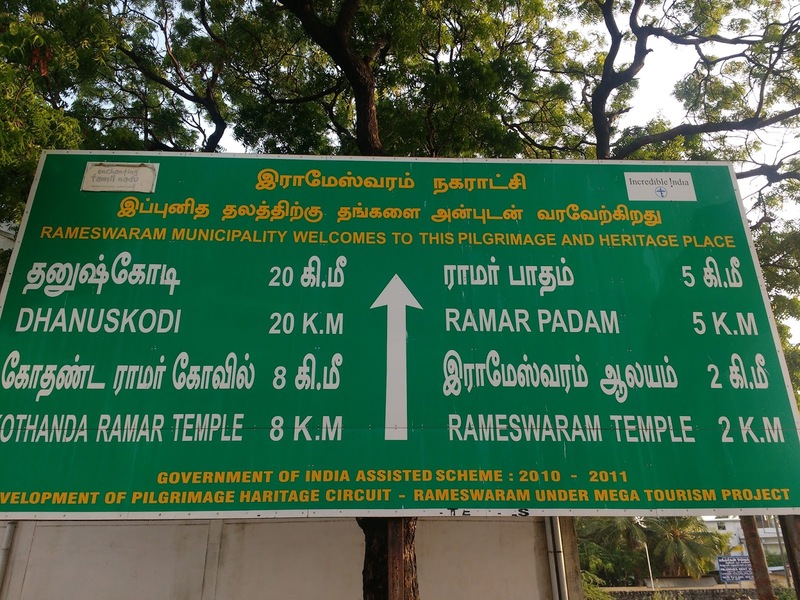 I reached Rameswaram at 6 am. I came to know only recently about the AC waiting hall. It costs Rs. 20 per hour and luckily it was not crowded. I freshened up there and set out to continue my journey. My next stop was Rameswaram temple. I was astonished and didn't understand for some time what I was seeing. 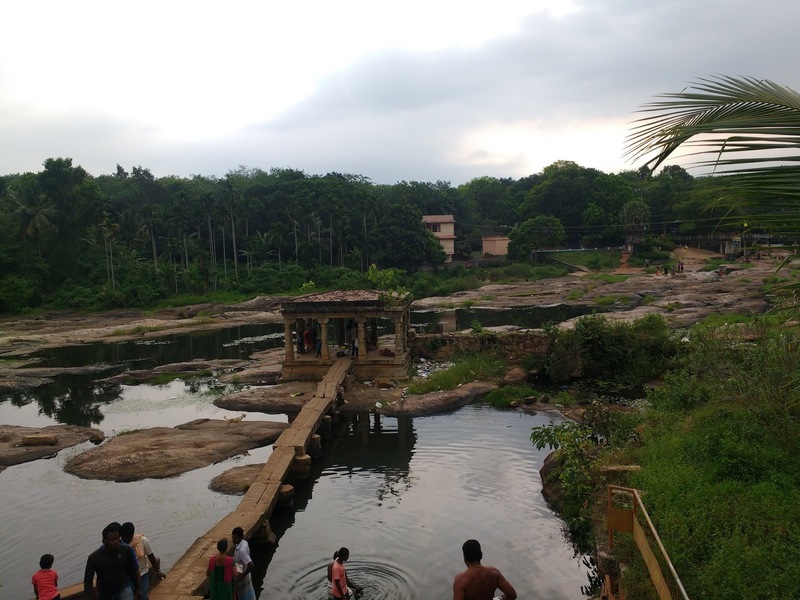 Many people were running amock and bathing from the different wells there. There were 22 wells! Only later I read the sign board which said that worshippers can take bath from the water from all the 22 wells (holy bath). I didn't take that bath as I'm not too much into it. What caught my attention were the pillars in the temple. They were so many and alike with minute and beautiful sculpted work. I was taken aback observing the work as I can't do any task repetitively and here, there were so many pillars made and lined exactly the same way. Later I went to the beach. It was a little crowded and moreover it didn't look like a sea. 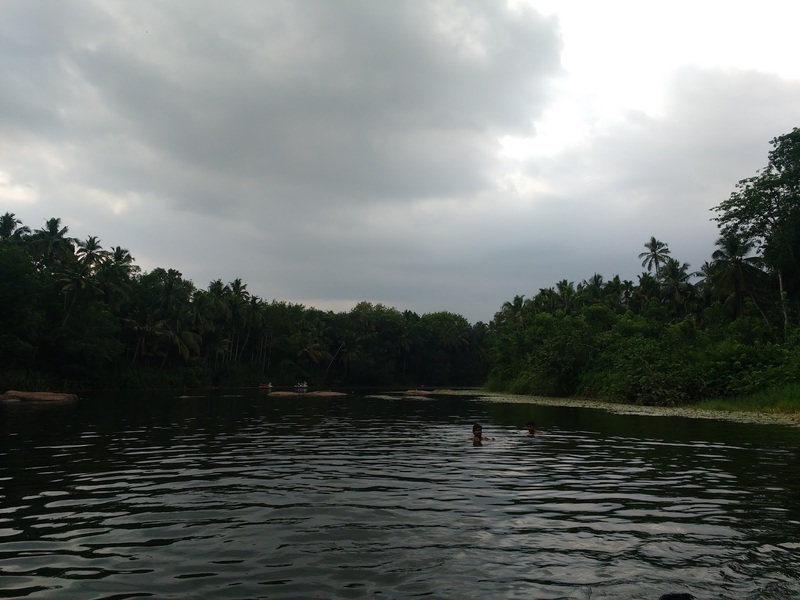 So I left that place and went to Ramar patham. It was 2.5 km away from the temple and I walked my way there. This place was beautiful and less crowded. 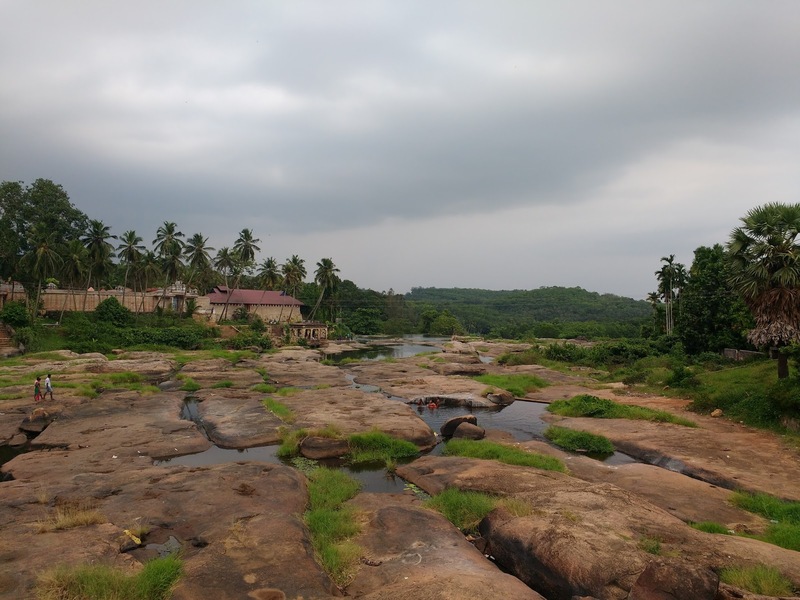 Then I visited the famous Pambam bridge which was 10 km from Ramar patham. I didn't know that seeing the sea from the bridge would be so beautiful. And watching a train pass by was even more beautiful. I spoke to a local guy there and we walked for some time over the railway track there. It was an amazing experience. A train was nearing us then slowly. There is some space to stand near the track when the train crossed us. Standing there and watching the train go felt even more good. 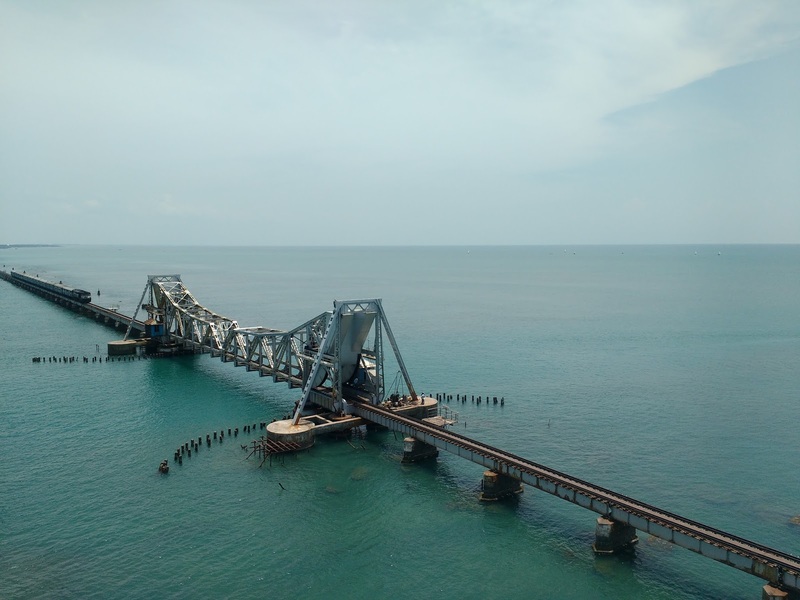 On the way back to Rameswaram from Pamban bridge, about 6 km from there, lies Dr. APJ Abdul Kalam's memorial. They didn't have any locker facility to keep our belongings. So I had to leave the place without going inside. 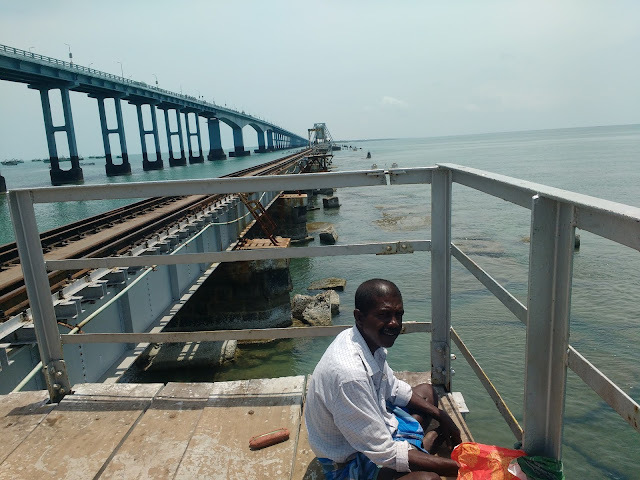 Then I went back to Rameswaram temple, had lunch and got bus to Dhanushkodi. Here the two seas meet each other. Some said there was a demolished building here but there was nothing. There is a Kothandaramaswamy temple between Dhanushkodi and Rameswaram. I thought it was also an ok place until I came to know the historical importance this place holds. 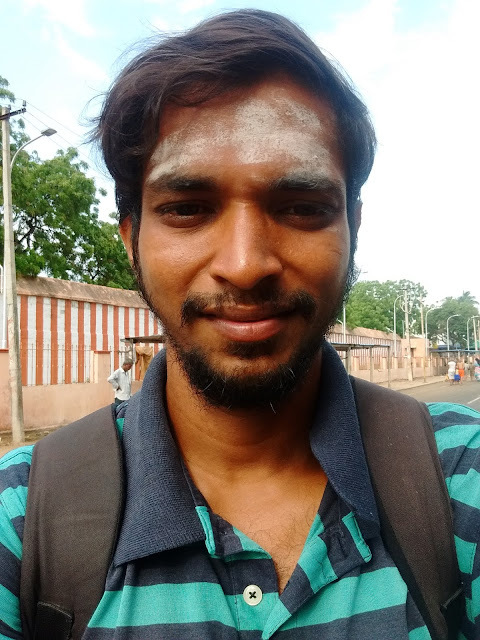 After the temple visit, I went back to Rameswaram to get my train. My phone didn't have charge for most of this trip which made me ask around for directions and places rather than using my phone to reach. Travelling allows us time for self reflection and I noticed that I'm slowly moving out of my comfort zone and feeling comfortable with it! With this small satisfaction, I boarded the train to Chennai. Once again, the train started and trip ended.